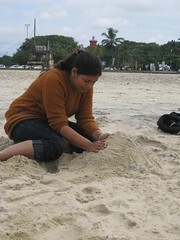 We(Me and Kanika) visited God’s own country Kerala b/w 25th – 29th’11. It was most eventful journey. We had to deal with the strikes in Maharashtra and Kerala. We catched the flight from Mumbai in last minute. 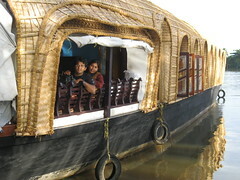 Then visit to beautiful Munnar, beach and house boat and Alleppey. We started our journey on 25th Nov’11. Just before a day someone slapped Mr. Pawar and there was band was called by NCP on 25th. We were not sure what to do? I thought it is not a big issue and I should follow what I planned . We planned to take a Bus from Pune to Mumbai and then catch the flight from there. After waking up 25th I saw the newspaper and it noticed that Pune will be Band on the day. I then decided to take a local from Chinchwad station to Lonawala and then take something from there but local train timing did not match. We discussed and then decided to stick with original plan and then see what happens. So, we reached the boarding point and took the Bus at 10:20 AM. I did not took printoutof the ticket so I had few heated words with the MSRTC Bus conducter as he was keep saying e-ticket is not allowed you need to have the printout of the ticket. Later he allowed though. Because of this incident I thought let me check the flight details and came to know that Kanika doesn’t have the valid ID proof with her. I called the Airline call center and asked them whether they need ID proof of both passengers and they said YES!!. They said scan copy will work only if it is attested. Now I had to quickly decide what to do?? As I was thinking the bus stopped for tea break before Lonawala. We quickly got down and saw another bus is going to Pune. We catched that bus and thought what’s NEXT? I then called Akshay(friend) and asked him go to my home and get the ID proof of Kanika’s. Then I called cab and lucikly he agreed to go in next half an hour. I asked him (Cab driver) to come at Ginger hotel by12 PM and same I requested to Akshay. So, at 12’o’clock sharp we reached at Ginger Hotel from Lonawala, Cab driver was from his home and Akshay from my home after getting ID proof. Awesome Timimg!!! By 12:05PM we were back on the highway for Mumbai. We reached to Mumbai just on time. Just before our boarding we saw Mr. Pawar just landed and he was peacefully exiting from Airport. We landed at Cochin airport at 6:30 PM and went to the hotel where we stayed over-night. Next day on 26th we started at 7:30 AM to Munnar. 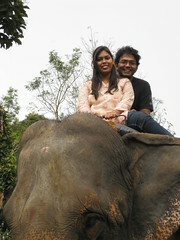 On the way to Munnar we stopped at Spice Garden where we got to see different spice plants and did Elephant ride. We also bought few fresh spices from there. We reached our hotel “Tea Valley” around 1:30 PM. As the name suggest it is located in the middle of “Tea Gardens”. The view from the hotel is just awesome.We thought as if we entered in another world. We stayed there for rest of the day and enjoy the entire view. Next day I woke up early and went alone for some trekking. After breakfast we started our sight visit for the day. I don’t remember the names but we went to see around five spots .Then we went to see National park “Eravikulam National Park“. It is the located at the highest peak (Anaimudi) in peninsular India. You can see different kinds of flowers. It is best known for Nilgiri tahr. Its a must visit place for any flower lovers. We then visisted the local market. 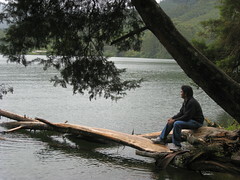 Later we came to know there is strike tomorrow in the Idukki district in which Munnar comes. So we must leave the distict by 6AM. We woke up at 4AM next day and left Munnar at 4:45 AM to Alleppey. We reached Allepey around 10 AM. As our house boat was booked from the noon we went to the beach. After that we went to our houseboatand came to know that now there is strike tomorrow in Allepey and Kochin, So we must checkout tomororw by 4:30 AM. The boat had three bedrooms, a kitchen, a dining space space and some living room. The interior was Good. Along wth us some other persons were also there in boat like a cook, a captain and a helper. Our boat started at 1PM. After getting ready we sat down in the sitting area and enjoyed the view. There were greenery all around. Coconut trees were on the sides of the backwater. That view was similar to what we saw usually in Paintings Galleries. We had lunch around 2:30 PM and then sat down at outside sitting area and enjoyed the view for rest of the day. The boats runs from 12:30PM to 5:30 PM only. In the evening it just stalls at the origin. In evening while returning all the houseboats looked like birds are coming back to their nests after a long flight. This boat trip was really a unique experience. One must have it atleast once in a life time. Rest of the time at boat was not up to the mark, as it was hot during evening time and A/C would start after dinner only. The service and food was not as good as expected. Next time if I come here I will take the boat ride but not spend the night at the boat. Thanks to the strike, next day we had to checkout at 4:30 a.m again. We reached toCochin airport around 6.15 a.m. Due to strike crowd was huge at the airport so we decided stayed at nearby hotel for rest of the day. There I got the time to write this detailed blog entry. We took our flight at 7:30 and reach Mumbai and then cab to Pune.Overall we enjoyed the trip. Everyone should visit the Kerala atleast once.